I have written many times about black grout and why I recommend it for making tile colors look more intense, but I don’t think I have ever taken the time to talk about using black tile for the same reason. 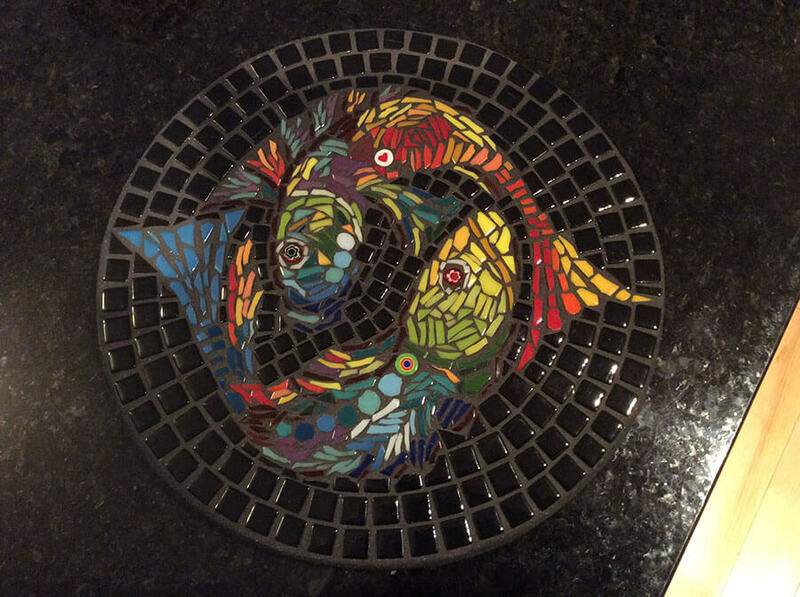 Artist Carol Jasin recently emailed me some photos of her work, and she makes great use of black tile to make a her mosaics look more colorful and more substantial. 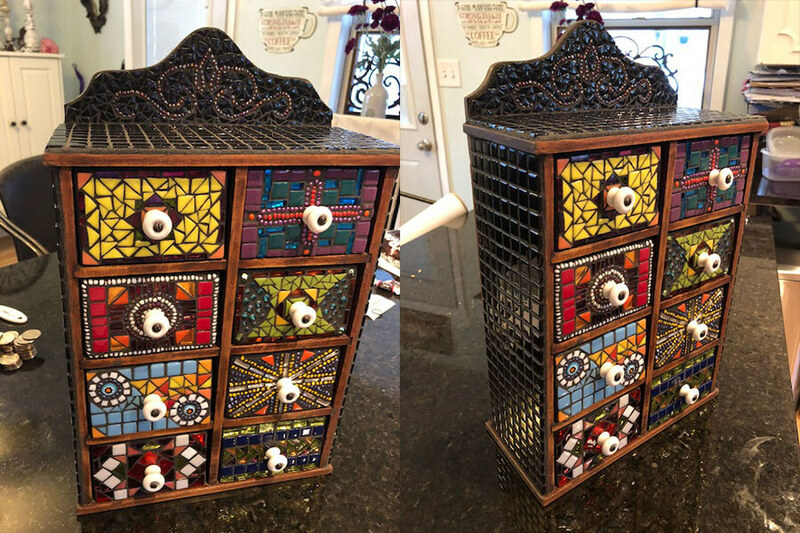 Mosaic Apothecary Chest by Carol Jasin. 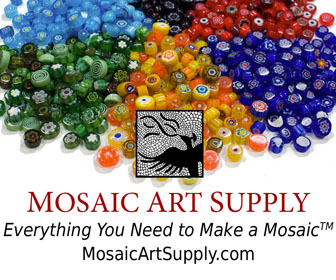 Compare Carol’s Mosaic Apothecary Chest to pique assiette furniture covered in patterned porcelain dinnerware. The pique assiette furniture is bright and white because the dinnerware is mostly white in spite of its patterning. The pique assiette furniture is beautiful, and its aesthetic is fantastic (Marie Antoinette does folk art), but sometimes you need a less ornate or less bright piece to work with the look and feel of an interior. By using darker colors (including black) with intense colors, you can have designs that are more subdued and more easily integrated into a room’s color scheme than the same design made with white tile. Definitely not. Sometimes black can stick out as badly as white. An umber or dark brown or darkest gray is often preferable to straight black. Carol Jasin is a stylist who owns a salon. 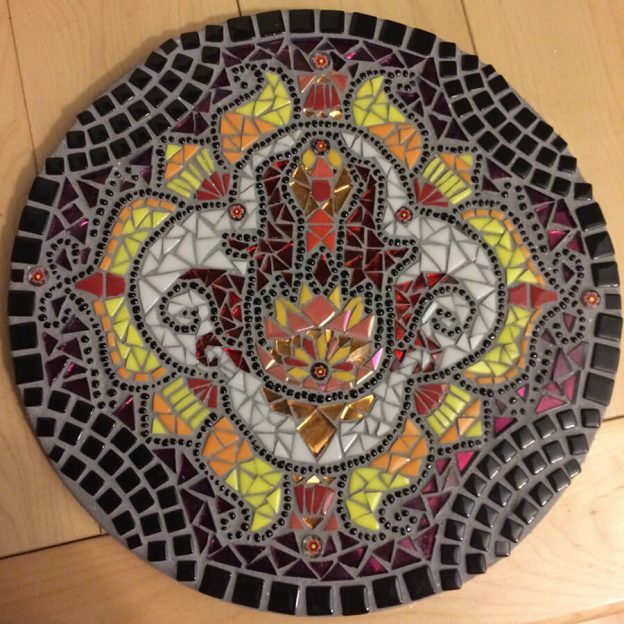 She started making mosaics about six months ago (and is making good use of all the previous time she spent thinking about design and art). This entry was posted in Art Review, Improving Your Art and tagged design considerations on January 8, 2018 by Joe Moorman. Most of these books have detailed instructions with lots of illustrations. I can remember feeling that way also. It is a great feeling. What I did at first (and this is true) I bought some glass and a cutter and “hid” under an antique piano while I practiced cutting glass. As soon as possible I took a class and got the equipment I needed. I created 6 panels that are hanging up in my house. The big surprise is the enthusiastic support I got from my family. This site also will be a great source of not only instruction notes, but ideas and encouragement to do whatever you can dream of.